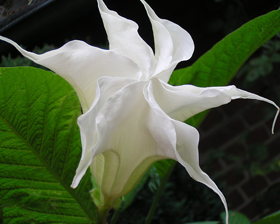 Huge and heavily fragrant pure white trumpet flowers, 20cm long and 10-15cm across, hang from tree-like plants, with soft, slate-blue foliage. Perfect for growing in tubs, containers, on patios or sheltered corners close to the house where the evening perfume can be appreciated. Despite their exotic appearance they are relatively tough under windy and rainy conditions, adapting to many soil types.